Is Apple taking design cues from HTC's two-tone cases? There's been quite a bit of chat surrounding the upcoming iPhone 5 case and it seems it's now 'appeared' in a video. The video comes via ETrade Supply, which thinks that it's in possession of the back plate of the sixth generation Apple iPhone. 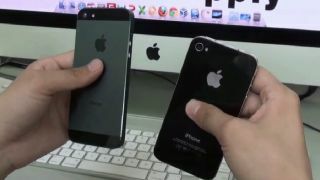 In the video we see the supposed case compared with the iPhone 4, revealing a taller dimension that's likely to house a larger screen – thought to be around 4 inches. We've already seen pictures of the case featured in the video, which confirms the relocation of the headphone jack to the bottom of the handset, with a smaller connector dock and redesigned speaker grills. The case also sports the two-tone metal-glass construction we saw in the original photos, which we reckon has something to do with NFC under the hood. The SIM port on the side appears to be smaller that the one found on the iPhone 4S, suggesting that the iPhone 5 may use nano-SIM technology. Of course, case manufacturers often chuck out any old rubbish based on leaked 'specs', so this could be just a case of another brand trying to cash in on the forthcoming iPhone hype. So without further ado, here's the video – we'll let you make up your own mind on the legitimacy of this, and let us know your thoughts in the comment box below. You can keep up to date with all the latest with our iPhone 5 release date, news and rumours article.